The Islamic State group's ferocious attack President Obama said the recent terrorist attacks on Paris will be met with lead to an "intensification" of the U.S.-led fight against the terror group Islamic State militants, President Obama said Monday, but it will not fundamentally alter his strategy nor his reluctance to put more U.S. troops on the ground in Iraq and Syria. "We have the right strategy and we're seeing it through," Obama said during the close of the G20 summit at a news conference in Antalya, Turkey, marking during the close of a summit of 20 nations. "There will be an intensification of the strategy we put forward, but the strategy that we are putting forward is the strategy that ultimately is going to work," he said. "But as I said from the start, it is going to take time." Friday's violence, which left at least 129 people dead, has raised new questions about the future of the military campaign against ISIS. For now, the Pentagon has made no significant changes to its ongoing operations in Iraq and Syria, where daily airstrikes are targeting territory controlled by the group, but the size of the U.S. ground force remains small. There have been no new deployments of personnel or weaponry into the region during the past several days, said Navy Capt. Jeff Davis, a Pentagon spokesman, said Monday. But Friday's violence attacks, which left in Paris killed at least 129 people dead, and were blamed on Islamic State militants. The attacks has raised new questions about the future of the American-led military campaign against ISIS, in Iraq and Syria, where daily airstrikes are targeting territory controlled by the Islamic State but the size of the U.S. ground force remains small. Still, what unfolded in Paris has prompted some adjustments. For instance, the U.S. and France have agreed on "concrete steps" to ramp up the fight against ISIS. That was the outcome of a Sunday phone call between U.S. Defense Secretary Ash Carter and French Minister of Defense Jean-Yves Le Drian, and will include an expanded intelligence-sharing agreement between the two nations, said Pentagon spokesman Peter Cook. Carter and his French counterpart discussed other measures and additional announcements may be forthcoming, officials said. Additionally, concerns about follow-up attacks in Paris prompted the U.S. European Command to prohibit American military personnel from undertaking any unofficial travel within a 50-kilometer radius of the city. Troops on official travel or emergency leave to Paris or elsewhere in France will need approval from a general officer, officials said. Military officials said they are making no across-the-board security enhancements at domestic military bases. Since February, the military's nationwide force-protection level has been elevated from Alpha, the lowest level, to Bravo, the second of four rungs on that scale. In New York City over the weekend, the National Guard increased its presence at several transportation hubs. Soldiers and airmen from Joint Task Force Empire Shield patrolled the city's busiest sites, including Penn Station, Grand Central Station, the PATH terminal linking Manhattan with New Jersey, and LaGuardia and JFK airports, said Eric Durr, a spokesman for the New York Guard. "We had more soldiers and airmen on than we might normally have during a weekend," Durr said. "We're continuing to maintain an increased visibility." JTF Empire Shield has been in place since the Sept. 11, 2001, terror attacks, and the troops augment local authorities across the city, Durr said. 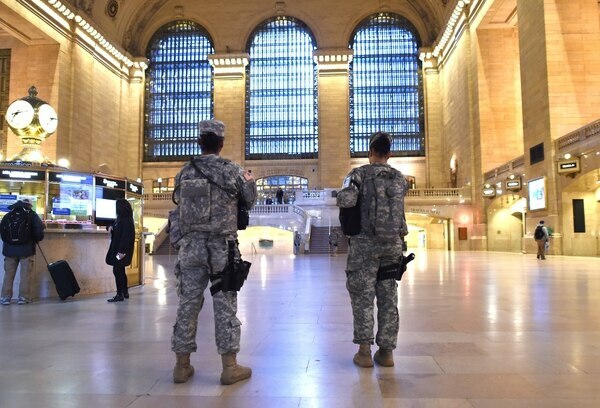 National Guard troops patrol Grand Central Station in New York on Saturday. "Our soldiers and airmen are another pair of eyes and ears in these transportation hubs that work with police," he said. "They're armed and visible, but our folks don't have law enforcement authority, so they assist the police." The task force, used at the discretion of New York's governor, is currently authorized 500 troops. The number of troops out and about at any given time varies depending on the security situation, Durr said. They work The soldiers and airmen in the joint task force are on duty 24-7, rotating in shifts to make sure there are always personnel on duty. In addition to JTF Empire Shield, the National Guard has two other key homeland security missions that have been in place continuously since the 9/11 attacks. The Guard's Aerospace Control Alert units provide round-the-clock protection of U.S. airspace across the country. The detachment in the Washington, D.C., area, part of the Air National Guard's 113th Wing, in March hit a milestone: it had responded to 5,000 alert events, the first unit in the country to do so, according to information released by the wing. "We have had 'Capital Guardians' on point, vigilant and ready to do what is necessary to defend this nation and the National Capital Region," said Lt. Col. John Vargas, commander of the 113th Wing's ACA detachment, in a statement released at the time. "Our operational tempo is more than any other alert center in the country." The 113th Wing's ACA mission round-the-clock alert teams ready to launch aircraft at a moment's notice to respond to airborne threats and air emergencies. The Guard also has air defense artillery soldiers from Mississippi in the D.C. area. About 200 soldiers from Mississippi's 1st Battalion, 204th Air Defense Artillery Regiment arrived in D.C. in October for their rotation. Their mission is to provide air defense and early warning to the region against any air attack, officials said. In the aftermath of the attacks in Paris, "I'm not aware of any plans to expand, enhance or bolster any of these missions" in response to Paris, said Rick Breitenfeldt, a spokesman for the National Guard Bureau. In Iraq, about 3,500 U.S. troops are supporting Iraqi and Kurdish forces in their fight against the Islamic State group, also known as ISIS or ISIL. In Syria, the Pentagon is providing military supplies to rebel groups fighting ISIS on the ground and recently authorized several dozen U.S. special operations troops to deploy there to support those rebels. The Paris attacks come at a time when the White House and Pentagon have shown a new willingness to put troops on the ground for targeted missions. U.S. forces joined Kurdish troops last week during a major operation to seize the Iraqi town of Sinjar and block a major Islamic State supply line. Yet Obama said Monday that he strongly disagrees with critics who believe he should authorize a large ground force of combat troops for deployment into Iraq and Syria. "It is not just my view, but the view of my closest military and civilian advisers, that that would be a mistake," the president said. "Not because our military could not march into Mosul or Raqqa or Ramadi and temporarily clear out ISIL, but because we would see a repetition of what we've seen before, which is [that the extremists will] resurface unless we're prepared to have a permanent occupation of these countries. "This is not, as I said, a traditional military opponent. We can retake territory. And as long as we leave our troops there, we can hold it. 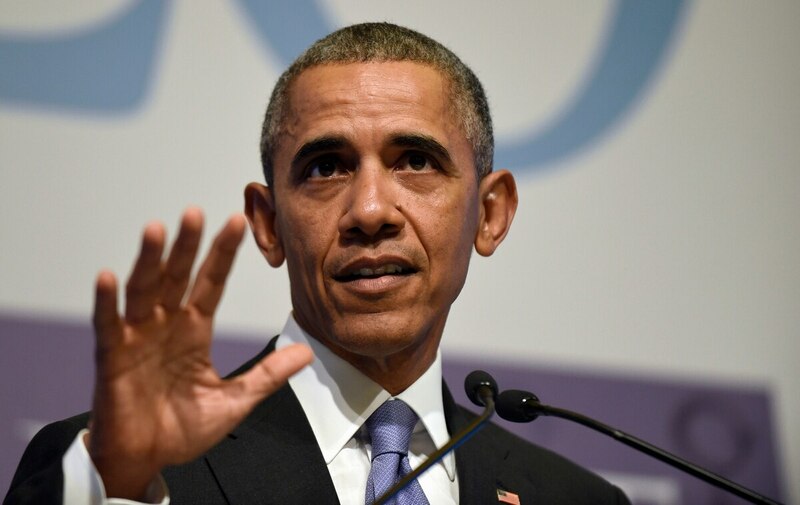 But that does not solve the underlying problem of eliminating the dynamics that are producing these kinds of violent extremist groups," Obama said. Obama said he continues to carefully weigh the cost of military operations and the impact of deployments on U.S. service members and their families. "I just want to remind people: This is not an abstraction," he said. "When we send troops in, those troops get injured, they get killed, they're away from their families. Our country spends hundreds of billions of dollars. And so, given the fact that there are enormous sacrifices involved in any military action, it's best that we don't, you know, shoot first and aim later. It's important for us to get the strategy right and the strategy that we are pursuing is the right one." For the past several weeks, The Paris attacks came at a time when the U.S. has been expanding its fleet of combat aircraft near the Syrian border. In September Turkey signed a historic agreement to allow U.S. combat aircraft to use its Incirlik Air Base to fly missions against ISIS. Since then, the U.S. has deployed about two dozen combat aircraft to the base. Twelve A-10 close-air support warplanes from the 75th Fighter Squadron out of Moody Air Force Base, Georgia, have been stationed in Incirlik since Oct. 20. 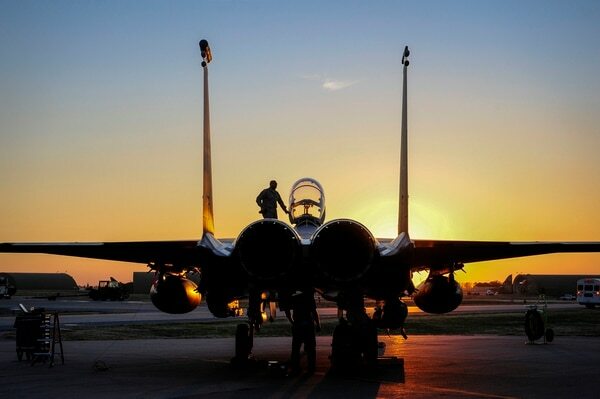 U.S. Air Force F-15E Strike Eagle sits after landing on Nov. 12 at Incirlik Air Base, Turkey. Six F-15Es arrived Nov. 12 to take part in airstrikes against the Islamic State group in Syria and Iraq, according to U.S. Air Forces in Europe, and six F-15Cs from the 48th Fighter Wing based at RAF Lakenheath, England, arrived at Incirlik on Nov. 6 to conduct air patrols aimed at protecting Turkish airspace. On Monday, four A-10s and two AC-130 gunships attacked more than 100 oil trucks in eastern Syria with hopes of limiting the militants' access to crude oil, according to reports. And while the military mission at Incirlik is expanding, the U.S. is removing some American family members due to security concerns. The Air Force recently extended the deadline for families of U.S. military and civilian personnel to leave, a spokeswoman said. Family members now have until Dec. 2 to voluntarily depart Adana, where Incirlik is located. The U.S. does not have an aircraft carrier in the region, which U.S. Central Command region. The carrier Theodore Roosevelt left the area in mid-October, leaving CENTCOM without a sea-based air wing for as long as three months, which has raised concerns among some lawmakers. The carrier Theodore Roosevelt departed the Persian Gulf in mid-October, and may not be replaced for another few months. In the meantime, the Air Force is carrying out the bulk of the airstrikes along with coalition partners. On Monday, the Truman Carrier Strike Group left Norfolk, Virginia, for the Mediterranean Sea, as part of a pre-scheduled deployment. Its five ships include the cruiser Anzio and destroyers Bulkeley, Gravely and Gonzalez. Officials expedited the group's departure sped up the group's deployment date to minimize the duration commanders fighting ISIS will be without a sea-based strike option chow long CENTOM would go without a flattop, while airstrikes against the Islamic State militants intensify. Now, in the wake of the Paris attacks, U.S. officials are discussing whether the Truman flotilla may linger in the Med longer than initially forecast in the Mediterranean, as a platform from which to launch additional strikes against ISIS. Staff writers Michelle Tan, David Larter, Meghann Myers and Oriana Pawlyk contributed to this story.